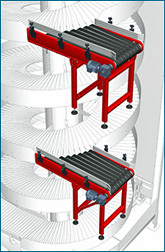 Ryson's multiple-entry, multi-tier spiral conveyors allow loads to enter the spirals from several different elevations and locations. This allows you to direct product flow from mezzanines, multi-story operations, and through pick modules with the same spiral conveyor tower. The conveyors work best when loads are fairly uniform in size and weight. High-speed induction conveyor provides controlled spiral entry. The conveyor belts are individually adjustable to match the spiral pitch. Traffic controls are required to prevent loads entering from different levels colliding in the spiral. 1700-400-HC 7'3" 5'7" 16" 1'7"
1700-600-HC 7'11" 5'7" 24" 2'3"
Multi-entry spiral conveyors are standard in types A, B, C, and D (below). Custom Solutions: The position and length of the in-feed tangent on up spirals and out-feed tangent on down spirals can be customized to meet specific layout requirements. Samples are shown below (A-EX, B-MA and C-EX). A horizontal section is provided at in and out feed to assure smooth transition between conveyors. C-EX: configuration matches the centerline of the top and bottom conveyors. Centerline offsets can also be accommodated. Multiple entry conveyor entry points with high speed induction conveyor units. Pick module application with spiral conveyor system for product conveyance from top to the plant floor.